It is clear from Figure 1 that base effect has come into play. During the period July to September 2017, the Indian economy had grown by 6.3%. This low growth had some role in pushing up growth to 7.1% during July to September 2018. Another interesting thing is that the non-government or private part of the economy grew at 6.4% per year, during the period which was much slower than the overall economy. The non-government part of the economy is calculated by subtracting the government expenditure number from the overall GDP number during the period. Figure 1: Fall in Growth. Take a look at Figure 2, which plots the non-government growth along with overall economic growth. Figure 2 tells us that the growth in the non-government part of the economy fell to 6.4% during the period July to September 2018. This fall in economic growth was clearly visible in other economic indicators like car sales and two-wheeler sales. Domestic car and van sales during the period July to September 2018 fell by 2.42% during July to September 2018. Two-wheeler sales grew by 4.9%, after having grown by 24.8% between January and March 2018 and 13.9% between July and September 2018. This document is only released four times a year…and the last one came out in June. Scooter sales, which are a good representation of urban India, grew by a miniscule 0.3%. This can clearly be seen as an impact of the depreciation of the rupee against the dollar. At the beginning of the period one dollar was worth around Rs 68.4. By the end of it, one dollar was worth around Rs 73. This along with higher oil prices made driving a costly exercise. This, in turn, had an impact on sales of cars and two-wheelers. This trend can also be seen in Figure 3, which basically plots the net exports or the trade deficit (imports minus exports) as a percentage of the GDP. Figure 3: The Oil Boil. Figure 3 makes for a very interesting reading. It tells us very clearly that the Narendra Modi government's luck on the oil front finally ran out during the period July to September 2018. The net exports as a percentage of the GDP fell to -4.78%, the lowest since Modi was sworn in as prime minister. This happened primarily because the price of the Indian basket of crude oil was higher than $75 per barrel, throughout the period. This pushed up the overall import numbers for the country. The exports did not rise commensurately, leading to net exports (imports minus exports) falling to -4.78% of the GDP. This along with a falling rupee, made oil more expensive in rupee terms, leading to higher petrol and diesel prices. This slowed down overall private sector growth. Higher oil prices cost the economy at least 1% of the GDP, during the period July to September 2018. 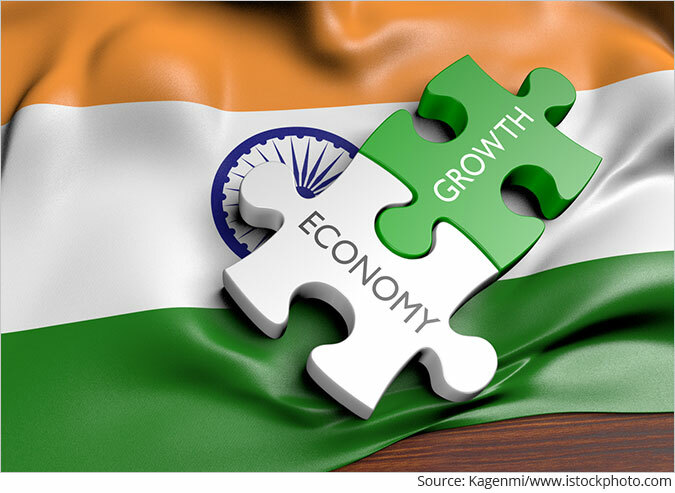 In this scenario, the overall economic growth was perked up by a growth in government expenditure of 12.7%. As I have often said in the past, increasing government expenditure to create economic growth can only perk up growth in the short-term. But the Modi government seems to have made it a habit over the last two years. The good thing is that Modi government's luck on oil prices seems to be back, with the price of the Indian basket of crude oil going lower than $60 per barrel (how wrong I have been on this one). The rupee has also gained against the dollar and one dollar is currently worth around Rs 70. The benefit of this can already be seen in the car sales number for October. Car sales are up 0.38%. This isn't much. Nevertheless, when we see the data for the period July to September 2018, where car sales actually fell in comparison to July to September 2017, this is a clear reversal of trend. Once data from November comes in, the trend will become even more clear. The two-wheeler sales for October 2018 grew by 17.23%, after growing by 4.9% between July and September 2018. Things have clearly started recovering. Another good thing that seems to have happened during the quarter is the revival of investment. Take a look at Figure 4, which basically plots the investment to GDP ratio over the years. Figure 4: Revival of investment? The investment to GDP ratio during the period July to September 2018 stands at 32.3%. This is the second highest in the last five years. While the overall trend of investment has been upwards in the last two years, it is still to get anywhere near its peak levels. To conclude, looking at the trends it is safe to say, that the GDP growth will resume its upward trajectory again, when the results for the period October to December 2018 are declared. We request your view! Post a comment on "Private Economy Slowed Down During July to September, But Should Recover Soon". Thank you for posting your view!